Prosciutto is quite salty, so you probably won’t need to add salt when seasoning this rich dish. Rinse chicken under cold running water and pat dry with paper towel. Trim excess fat and parson’s nose from chicken. Spoon prosciutto and half of mascarpone into cavity of chicken. Rub 1 tbsp of oil over chicken and season with pepper. Heat remaining oil in a large flameproof casserole pan on high. Cook chicken, turning, for 5 mins, until golden all over. Add wine, herbs and garlic to pan and cook for 1-2 mins, until wine reduces by half. Reduce heat to low, cover and cook for 1 hr, turning chicken every 15 mins, until cooked through. Remove from heat. Set aside to rest for 20 mins. Remove chicken from pan. Strain juices into a jug, discarding herbs. Return juices to pan. 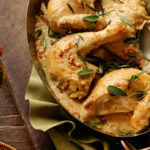 Remove mascarpone and prosciutto from chicken and add to pan with remaining mascarpone. Bring to a simmer on low heat. Blend with a stick blender until smooth. Season. 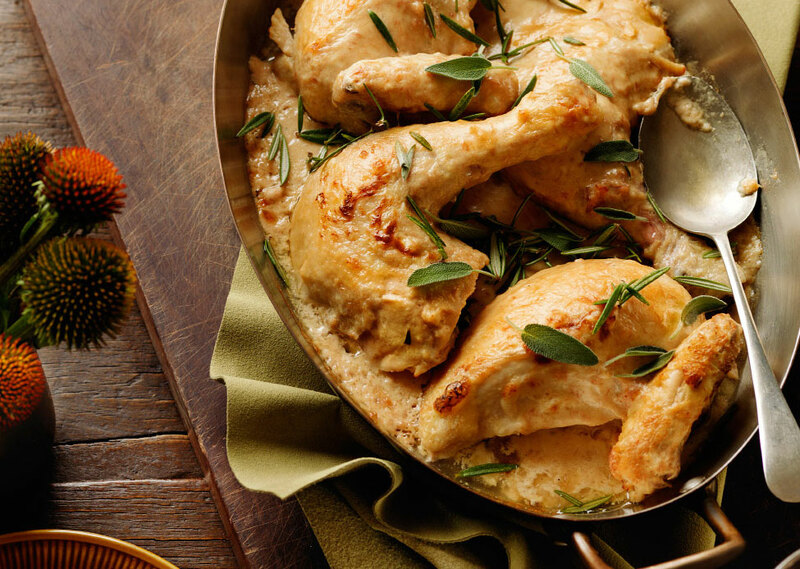 Cut chicken into six pieces. Return to pan and simmer for 5 mins, until heated through. Top with extra sage and rosemary, if using.